No one will argue that the 80s featured some of the best cartoons around. Transformers, G.I. Joe, M.A.S.K., Thundercats...the list goes on. One of the shows also in those halcyon days of animation was Jem and the Holograms, a seemingly outlandish show about women rockers. It was a great show and makes for a great comic, thanks to IDW's release of Jem and the Holograms #1. The issue is written by Kelly Thompson, illustrated by Sophie Campbell, colored by M. Victoria Rabado and lettered by Robbie Robbins. Jerrica Benton has a secret accompanied by terrible stage fright. As the lead for the Holograms, her talents as a singer-songwriter are second to none, yet her reluctance to showcase those talents in front of the cameras is what causes tension between her and the band. That doesn't really sit too well with Kimber, Shana and Aja, all of whom really want the band to work. What ensues is a mix between band drama and sibling bickering, all of which takes a back seat to the reveal at the end of the issue. The crux of Jem and the Holograms #1 is Jerrica's inability to reconcile talent with fear. Thompson subtly explores that through the band's dynamic, as her sisters really want to do the band, but also realize Jerrica is an important part. The presence of Synergy at her father's house emboldens her to overcome her fear, even if she doesn't do it in the traditional "facing it" way. Thompson's dialogue is meticulous and allows the personalities of each sister to start standing out from the others. The reader really feels as if they're getting to know the family through their bickering and what is very obviously a love for one another. For a book such as Jem and the Holograms #1 to work, the art has to work and Campbell does a fantastic job. The linework is sharp and concise, forming characters that feel appropriately rendered for the property itself. Each sister looks like an individual; it would've been easy for Campbell to recycle some aspects of appearance for the four of them, but thankfully their diversity further underscores their individual personalities. The sisters stand out amidst somewhat spartan backgrounds, courtesy of Rabado's explosive color choice. If you ever wondered what a comic book about spring would look like, then Jem and the Holograms #1 is it, as Rabado relies on neons and pastels to bring the world to an effervescent life. 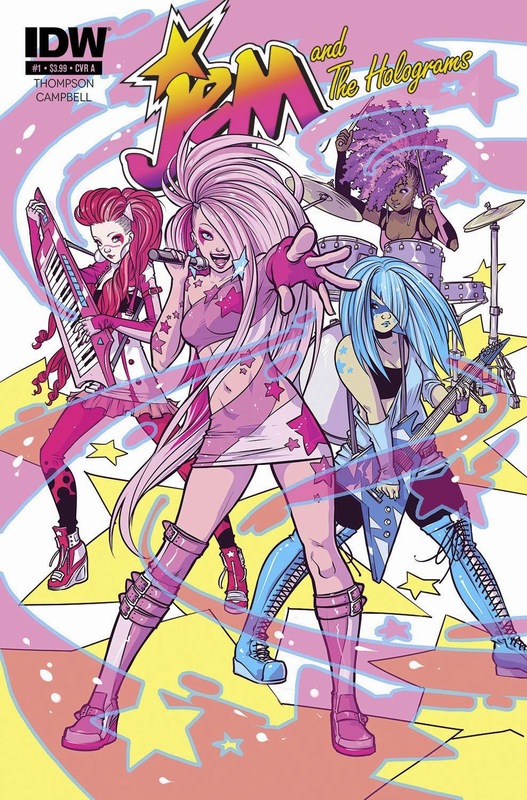 Jem and the Holograms #1 features a very simple plot and approach, but it works. Jerrica finds a newfound confidence in a pair of star earrings and the Holgrams are poised to break out. Thompson's dialogue gives each sister their own voice and methodically moves the plot along without getting too far ahead of itself. Campbell's art is very clean and attractive, demonstrating a focused approach that's accented by Rabado's bold color choice. Jem and the Holograms #1 will appeal to nostalgic fans familiar with the property, as well as new fans looking for a fun book to read. Jem and the Holograms #1 is in stores now.